Some days are hard. Some days, I want to shove milk dunked Oreo cookies in my mouth until the black chewed up cookie makes my smile look like a methhead’s rotted toothy grin. Some days, I want to dial up the pizza delivery boy and dine on a circular disk of nothing but carbs and fat rather than eat the umpteenth grilled chicken breast that week. Some days, I just don’t care. On those days, I have to remind myself about all the little things that are better now because of the lifestyle changes I have made. Tonight, I thought about two things I was recently reminded of. 1. Have you ever been to a spa where they hand you a robe and instruct you to change your clothes and head into the relaxation room? I have. Let me tell you, when you exceed the unadvertised weight limit of those spa robes, the relaxation room ain’t so relaxing. First, there’s that anxious moment when you try the robe on and pray to God Almighty that the thing will at least wrap around you enough to maintain some shred of common decency. It is extremely hard to relax when you think all the folks sipping herbal tea listening to the sounds of trickling water in the relaxation room can see everything you got and then some. Those darn little robes are always marked “One Size Fits All” which is a flat-out lie from the devil. I had a massage a couple of weeks ago. When they handed me a robe, initially, an anxious feeling flooded my mind as I slipped the satin fabric around me. I had forgotten I was smaller now and it wrapped around with more than enough to cover what didn’t need to be seen. Now, I could actually relax in the relaxation room. 2. We are huge football fans. 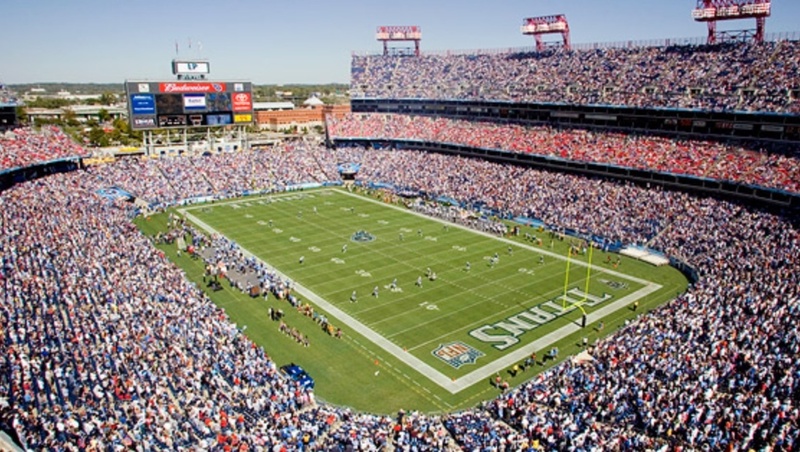 Tennessee’s Titans and Alabama’s Crimson Tide are our teams. They balance each other well. Bama almost always pulls out a win and Tennessee almost always forgets to play the last quarter of most games. Tennessee keeps us humble. If we were strictly Alabama fans, we could get obnoxiously cocky rooting for the most dominating powerhouse of all time playing in the most dominating powerhouse of all conferences, the Southeastern Conference. But, without sounding too unabashedly arrogant, I digress. Being a big old football fan, I find myself going to football games in stadiums across the south. No matter what stadium, no matter where, one thing holds true. Stadium seating is not One Size Fits All. I have wedged, squeezed and stuffed myself in plastic stadium seats, ashamed of my fat rolls billowing out the side encroaching on my neighbor’s personal space. I have sucked in my gut and side walked the row to get to my seat trying not to take out small children with their cotton candy and grown men with their plastic Budweiser beer bottles embarrassed of my thick thighs and wide rear. At the latest football game, I realized I fit in my seat. My seat and only my seat. So what if I hip checked the old man who sits down the aisle from us and screams like a wild hyena every play. It wasn’t because I was too big to fit down the aisle. It was my passive-aggressive attempt to shut his screaming up once and for all. Most of the time thinking about all the little victories along the way doesn’t make the days any easier. It just makes the way I handle them better. I mean Oreos are awesome but even they can’t make my problems any less of a problem. But cupcakes on the other hand……….nah, not even cupcakes. Valerie when I receive your post in the morning they are always one of the highlights of my day. It gives me my first laugh of the day. Girl you are hysterical. Just my kind of lady. Keep it coming and keep up the good work your doing (yes it is work I know). Your looking good. Love this. Keep writing. I can’t wait to read all of your blogs.